Paul Slabolepszy’s latest play, Suddenly the Storm will form part of the Playhouse Company’s Women’s Arts Festival. The production walked off with Best New South African Script (Paul Slabolepszy), Best Theatre Set Design (Durban’s Greg King) and Best Lighting Design (Wesley France) awards this year’s Naledi Theatre Awards. Following its unprecedented success at the Market Theatre and the Theatre on the Square, this riveting drama ran at the Baxter Theatre in July. Suddenly the Storm premièred at the Market Theatre in 2016, launched to coincide with the 40th anniversary of the Soweto Uprising of 1976. 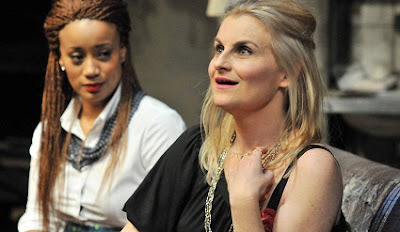 The play is set in the far East Rand, in the home of an ageing ex-cop and his much younger wife. A storm approaches…Namhla Gumede, born on 16 June, 1976 arrives, seeking answers to questions that have remained buried for 40 long years. What begins as a smouldering dark comedy turns suddenly into a roller-coaster ride of startling revelations, of rage and recrimination, before the storm finally breaks. Suddenly the Storm will be staged on August 10 and 11 in The Playhouse Loft Theatre at 19h30, and on August 12 at 14h00 and 19h30. Tickets R80 booked through Computicket or Shoprite Checkers. There is an age restriction of 18 (strong language).